There are many factors to consider when you are taking on a renovation project. The first would be to get your ducks in a row once you have decided on a room that needs your attention. 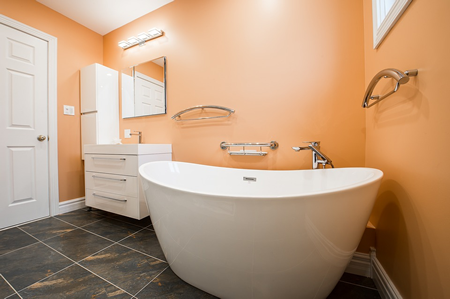 You have considered your budget and decided to renovate your bathroom. There are various factors you need to be prepared for, and keep in mind at all times when you take o a project like this. First, you need to be realistic on your timeline. This means you would need a clear indication of how long such a renovation might take. Secondly, is this the only bathroom in your house? Do you need to make other arrangements and possibly move out for the duration of the project? If you are lucky enough that you don’t need to move, you need to consider things like, on-going availability of hot water, electricity supply etc. Invariably the electricity supply can be maintained. Fancy yourself a little project? or are you looking to get the renovation complete sooner rather than later. It is always better to hire a team to do the renovation for you. Contacting a project management company in your area could be the answer to all your questions, as they will have a team they know and trust, to ensure your possessions are safe, and they’ll work like a well oiled machine because they have been working together for a long time. Plus, you’ll have the project manager to answer any questions and give you updates on progress of the renovation. When considering a renovation project, it’s always better to use renovators with years of experience and have peace-of-mind. Your next step is to consider the materials you will be using in your bathroom. If you are tiling, you’ll need to consider tiles, grout, adhesives. You’ll also need to think about taps and bathroom fixtures. Will you be buying the supplies yourself or should you consider using a team of renovators to help you. Chances are, most contractors have certain suppliers they use and are likely to get materials needed at a discounted price. A2Z Maintenance does all of this for you. We have an established team of contractors we work with and we pride ourselves on our quality of work. If you would like a FREE quote , You can contact us so we can talk to you about your renovation requirements.